My mom had the good idea to make cinnamon-applesauce ornaments with my 4 year old this year. The process is fun and messy and smells delicious, just as all good Christmas kitchen traditions should! If you are looking for a fun and memorable activity now that your kids are off for Christmas break, give these easy ornaments a try! All you need to make the ornaments are cinnamon and applesauce. Some recipes call for glue as well, but I am not sure it is really necessary. For every 4.25 ounce bottle of cinnamon, you will need to add 3/4 cup of applesauce. Be sure to have extra cinnamon on hand to “flour” the dough to make it less sticky.TIP: I bought my cinnamon at Dollar Tree which saved a bunch of money. Dump out all the lovely cinnamon. Give it a second to settle before you inhale the lovely scent; coating your lungs with airborne cinnamon might ruin your ornament-making experience. Mix the two ingredients together until it forms a ball. It takes a little while, so be patient. Sing a carol or something. If your dough seems too dry or crumbly, mist it with a little bit of water. We also found that the dough is easier to work with if you let it sit for a few minutes before you roll it out. Roll the dough out to about 1/4 inch thickness. If the dough sticks to the rolling pin, dust the dough with more cinnamon. I am so bummed this picture ended up being blurry! Cut the ornaments out using cookie cutters, and use a spatula to transfer them onto a cookie sheet. Use a drinking straw to punch a hole near the top so the ornaments can be hung from ribbon or wire later. You can either let the ornaments air dry overnight, or do like we did and bake them in a 200 degree oven for 2 hours. 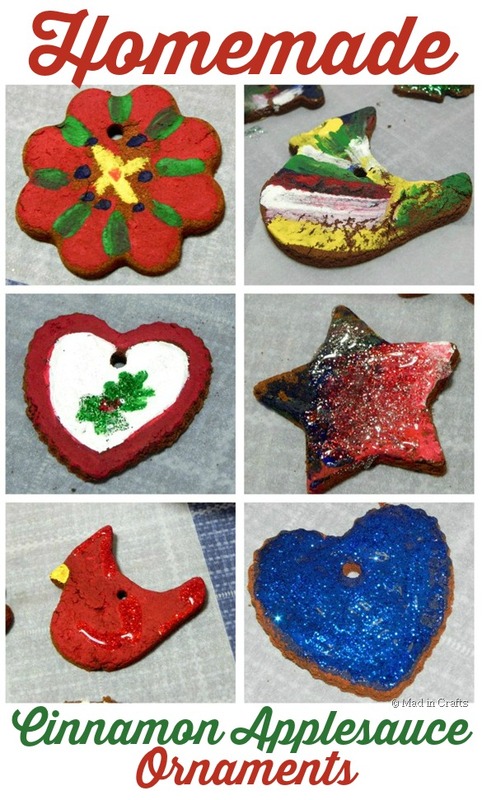 Once the ornaments are dried, you can use regular craft paint to decorate them. The ornaments will absorb a little of the paint since they are so dry. You may need more than one coat to get a really bold color. We also used glitter glue from Dollar Tree to decorate the ornaments. I hope my son used enough on this tree ornament…. My mom decorated this ornament with craft paint and glitter glue.Side note: See those rough edges on the bottom? According to some sources, you can take a nail file and lightly sand that excess off. I don’t think we even bothered. I put a coat of Martha Stewart Glitter Finish medium over this whole ornament which gave it a glittery shine. I gave this star a thick coat of Martha Stewart Glitter Texture. I love the snowy look it has! Here’s a sampling of some of our colorful ornaments. The best part is that, even though we painted them, they still smell like cinnamon. So yummy! I wired some of the ornaments to a wreath of greenery and then wrapped it in the pompom yarn I used on my Christmas tree this year. My son informed me that this was an Angry Birds bird. There is the Glitter Texture ornament all dried. It really sparkles in the light. The Glitter Finish medium coated ornament has more of a multi-colored sparkle, which is perfect for a decorated tree ornament. In case you were wondering, that bell does ring every time we open and close the door. It’s like we are living in some little shop. I threaded a few more of the glitter glue ornaments onto the same pompom yarn and draped it on my baker’s rack near my Screen Printed Bow and my Snarky Christmas Canisters. I like the idea that every Christmas we can unpack these ornaments and remember all the fun we had making them together! How many ornaments can you make from 1 batch of dough (1 container cinnamon with 3/4 c applesauce)? We didn\’t have an exact count, but we made at least two dozen. Hope that helps! This is a great suggestion! Thanks!